When I am working on custom wedding stationery I am often asked to match the envelope calligraphy colour to one of the colours featured on the invitation. It can be really hard to find the perfect matching shade, so I usually mix my own ink using gouache and distilled water, it's a very simple thing to do and relatively low in cost! Distilled water (optional) - Distillled water will ensure that your ink does not go mouldy after time. - Add a pea sized amount of gouache to your pot along with a small amount of distilled water. -Add a drop of gum arabic to help bind the paint and water, this will make the paint adhere to your paper and will ensure the ink does not smear if rubbed. 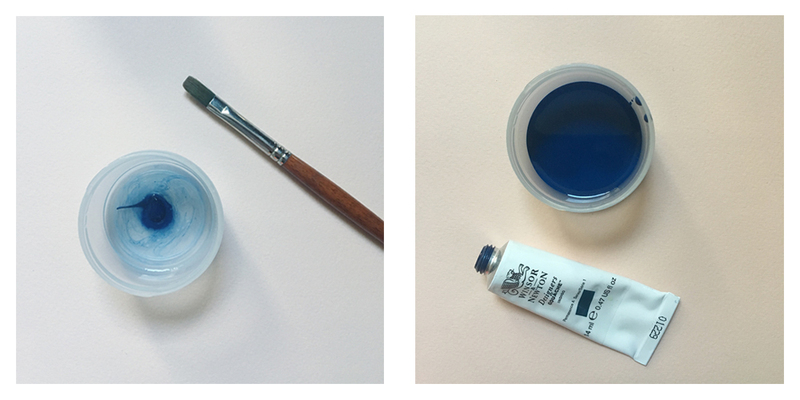 The gum arabic will increase the drying time of the ink so make sure not to touch the ink too soon! Once it looks like your ink has the correct consistency test the ink on your paper. If it's too thin the ink will run straight off your nib - add more paint. If the ink is too thick it will not flow through the ink reservoir - carefully add a little more water. I hope this simple tutorial helps, let me know in the comments below if you have any questions.